oh what a picture 300 is. ch was trying to make a crazy bridesmaid's hat for Lady Blangenue to wear in his play (which is running NOW you should see it!) and this is what he created. 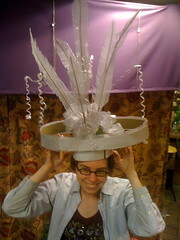 sadly, it was usrped by the real thing, but this hat lives on as someone's fabulous lady gaga halloween costume.